I found Bernard Malamud in a used bookstore in Bangkok, Thailand. Meeting like that, I believe, was some kind of destiny. If you could imagine how many books are there to read, how many talented authors are there yet to be discovered, stumbled into a good literature you hadn’t been anticipated was like finding a pearl in a vast ocean. I had never heard of Bernard Malamud before, not even in Bookstagram, I was lucky the book found me. The Assistant was set in Brooklyn, New York in late 1950s. The centre of the story is a grocery store owned by Morris Bobber, a Jewish immigrant, and his family; Ida, his wife and Helen, his daughter. Morris has owned the grocery store for almost 20 years and although he’s had some good days, it seems that he never really succeed in being a salesman. His grocery store, at the beginning of the story, is doing badly. Morris blames this to a new delicatessen that has just opened in their street, taking all his customers, but more than that, he blames himself for not being educated enough and lucky enough, for dragging his family into the hardship he should have endured alone. Ida has been thinking of selling the store but even that is hard to do, their business is not doing really well to attract buyers. Their 23-year-old daughter, Helen, has to give up her dream of going to university and gets a part-time job to support her family. One night, when Morris is about to close the store, two masked guys barged in and hold a gun to Morris, demanding all the cash in the till. When they only find $10, one of them thought Morris hid it and hit his head. For a few days, Morris has to stay in bed and the store can only open half day. The business which is already suffering is doing even worse. Then one day, Frank Alpine, an Italian stranger who has lived renting a room in the neighbourhood, shows up in Morris’s store. He helps injured Morris take the milk crates inside the store and they start talking. Frank, a 25-year-old guy who has the weigh of the world on his shoulders, gets Morris’s sympathy. When Frank offers his help in exchange for food and bed, Morris agrees. Ida, however, distrusts a goy (someone who is not Jewish) living under the same roof with her family. She’s also afraid that he will get involved with Helen as she already pictures the perfect husband for her daughter (two Jewish suitors with good backgrounds and, she believes, promising future). Despite all her arguments, Ida has to admit that the store is going better with Frank behind the counter. He cleans the shelves, washes windows, scrubs floor and more importantly, he’s a gifted salesman. He’s friendly and approachable, drawing more customers – old and new – into the store. And naturally, Frank falls in love with Helen. Things are going well but turning each page readers will realise that there is something wrong going on. Its simplicity in prose and dialogues and at the same time, its depth and complexity in plot and messages make The Assistant a special book. Each character is alive in Malamud’s pen and their aspirations, feelings, hopes, desperations, all can be read in such simple sentences. No word or phrase is wasted. The most complex character is Frank Alpine and Malamud describes the fight Frank has with himself skillfully. We understand Frank, sympathise with him, and cheer him. Helen is a character I can relate to, as well. She is really determined, longs for a higher education, and in a way, as you can read in the quotation above, has a vivid image of how things should be. She refuses to see what in front of her and builds images that fit her satisfaction. But of course, this is the only way for her to survive. The Assistant tells a story of how a man trying hard to change himself. It’s not just the situations or opportunities, it’s a fight that each of us might be familiar with. We know what to do to be good yet we always lose ourselves to temptation, to get a shortcut, to have it easy. Definitely a book no one should miss. 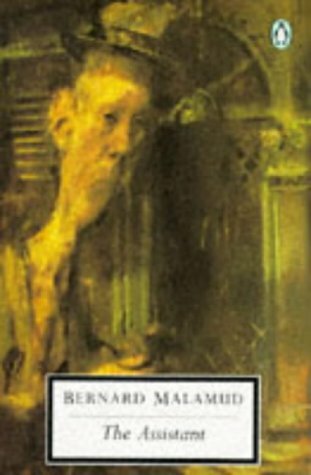 This edition of The Assistant is published by Penguin Books (1992).